If you've been looking for a Slow Twist Pelham Bit you came to the right place. These Pelham Bits happen to be one of our best sellers due to it's impeccable craftsmanship and affordable pricing. The slow twist increases impact of the bit. 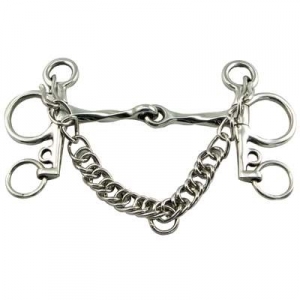 This bit is also made of stainless steel and measures 4'' in the cheeks. We know how hard it can be to find a great deal on a Pelham Bit. This is why we offer all our products at discount prices to help our customers save and want to come back for future purchases.